1,000 mg - Double Strength Enteric Coated 100% Pure NKO® Phospholipid-Bound Omega-3 Supports Joint Health* Neptune Krill Oil (NKO®) is known for its unique fatty acid (FA) profile, which includes EPA and DHA, plus phospholipids. In addition, NKO® naturally has astaxanthin, a powerful free radical scavenger and immune-supporting carotenoid. * Clinical studies have shown that NKO® can help to support joint comfort, healthy blood lipid levels already within normal range, and may help to maintain healthy feminine balance. * The phospholipid-bound forms of EPA and DHA from krill oil have also demonstrated exceptionally high bioavailability. 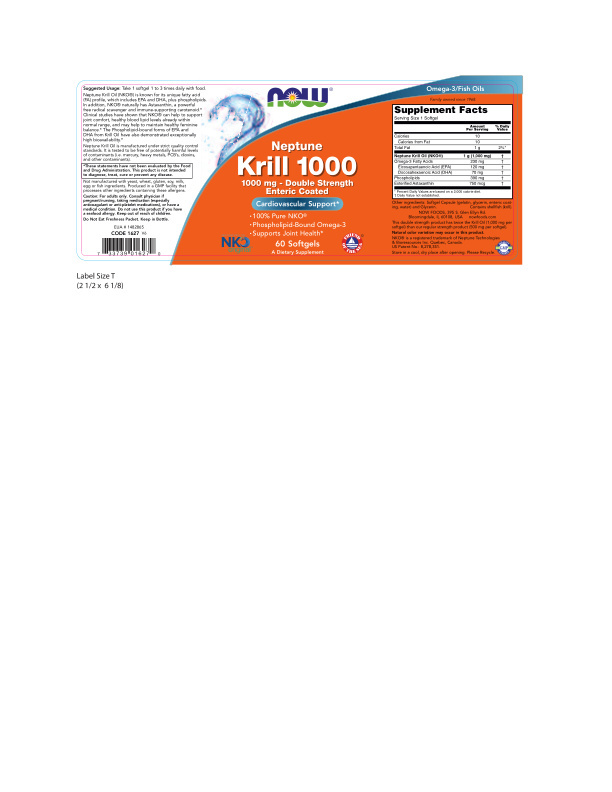 * Neptune Krill Oil is manufactured under strict quality control standards. It is tested to be free of potentially harmful levels of contaminants (i.e. mercury, heavy metals, PCB's, dioxins, and other contaminants). This double strength product has twice the Krill Oil (1,000 mg per softgel) than our regular strength product (500 mg per softgel). NKO® is a registered trademark of Neptune Technologies & Bioressources Inc. Quebec, Canada. US Patent No. : 8,278,351. Natural color variation may occur in this product. Supplement Facts Serving Size: 1 Softgel Servings Per Container: 60 Description Amount per Serving % Daily Value * Percent Daily Values are based on 2,000 calorie diet.† Daily Value not established. Calories 10 Total Fat 1 g 1%* Neptune Krill Oil (NKO®) 1 g (1,000 mg) † Omega-3 Fatty Acids 230 mg † Eicosapentaenoic Acid (EPA) 120 mg † Docosahexaenoic Acid (DHA) 70 mg † Phospholipids 390 mg † Esterified Astaxanthin 750 mcg † Other Ingredients: Softgel Capsule (bovine gelatin, glycerin, enteric coating, water) and Glycerin. Contains shellfish (krill). Not manufactured with yeast, wheat, gluten, soy, milk, egg or fish ingredients. Produced in a GMP facility that processes other ingredients containing these allergens. Caution: For adults only. Consult physician if pregnant/nursing, taking medication (especially anticoagulant or anti-platelet medications), or have a medical condition. Do not use this product if you have a seafood allergy. Keep out of reach of children. Do not eat freshness packet. Keep in bottle. This double strength product has twice the Krill Oil (1,000 mg per softgel) than our regular strength product (500 mg per softgel). Natural color variation may occur in this product. NKO® is a registered trademark of Neptune Technologies & Bioressources Inc. Quebec, Canada. Store in a cool, dry place after opening. Please Recycle US Patent No. : 8,278,351. Family owned since 1968. For adults only. Consult physician if pregnant/nursing, taking medication (especially anticoagulant or anti-platelet medications), or have a medical condition. Do not use this product if you have a seafood allergy. Keep out of reach of children. Do not eat freshness packet. Keep in bottle.